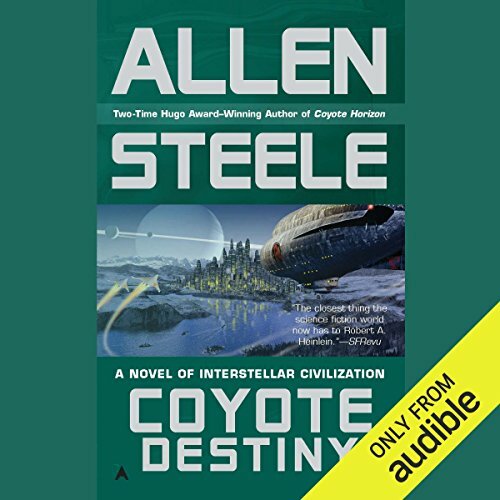 The unexpected arrival of a ship from Earth after their long isolation from their home world leaves the inhabitants of Coyote both hopeful and wary. The lone passenger brings news - both good and bad.The good news is that there was a survivor of the long-ago explosion of the Robert E. Lee and he is living still on Earth, in the ruined city called Boston. The bad news is that the person responsible for that act of terrorism is also still alive - and somewhere on Coyote. BONUS AUDIO: Includes an exclusive introduction by author Allen Steele. ©2010 Allen Steele (P)2010 Audible, Inc.
Great story. But there needs a 6th or even a 7th book. Questions need to be answered! What Hawk is doing on Earth, will the Aliens allow travel to Earth? Who is going to take Hawks place on Coyote? What else is happening on Coyote? Come on Allen write a few more books and make some more money while your at it. I have always been a fan of the Coyote series but this Book may be a bridge to far. I found this outing somewhat stilted and lacking the energy of the previous novels. I also felt that this story lacked any real credibility with endless wrap-ups needed to explain weak plot lines. Still looking forward to Steele's next project, as there is no doubt that he is a real talent. I really enjoyed the first couple books in this series. But this one has gonet far afield. Hey Steele, the series is about colonizing a new planet, remember? This book should have been a couple chapters in the last book, though it wouldn't have helped that one either. It came across as another infantile rant against organized religion. But his solution is so silly that it makes the whole effort worthless. The characters have all merged into two radical camps - the enlightened and the brainwashed. It's been done to death and this treatment adds nothing. What was one of the most memorable moments of Coyote Destiny? You keep waiting for excitement, alas. Any author has to invest a good deal of his story to character building. Unfortunately, most of this story is given to the characters talking, doing little else, then traveling, to do more talking. What few actual events take place are very short. Conflict is almost resolved before it begins. Wasting that much time to find a man that was already repentant. I found myself asking why didn't he just turn himself in instead of making me listen to all that. What does Peter Ganim and Allen Steele bring to the story that you wouldn’t experience if you just read the book? You do get the feeling of age, of weariness, of one last task before some of the characters lay their burdens down. What character would you cut from Coyote Destiny? I would have left most the elder generation out of the story all together. I only read the last book in the series but my will I not get another.